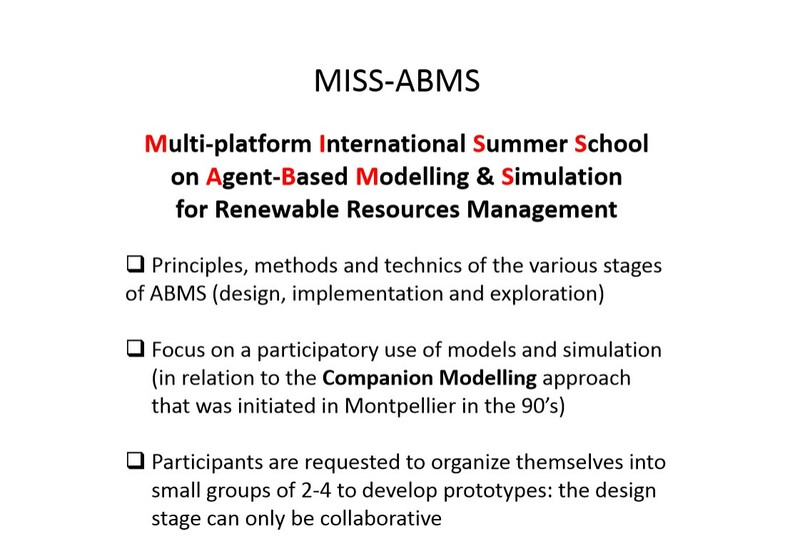 This summer school is about learning the different skills required for building agent-based models for renewable resources management. It is multi-platform - you will eventually work with only 1 platform but you will be introduced to 3 of the most prominent platform in the field of ABM (NetLogo, Gama and CoRMAS) and you will have many opportunities to collaborate with participants using the other platforms. It is focusing on model design AND implementation. You will learn and practice intensively conceptual modelling with a graphical conceptual modeling language called UML and implement (coding) a model within 1 of the 3 platforms. Models exploration, calibration and sensitivity analysis will be introduced and initiated but it is not a focus of the school. It has a strong focus towards a collaborative practice of modelling and simulation - we all work as modellers within pluri-disciplinary grounded projects and we believe that models are powerful objects for emulating collective work and thinking. We are used to share, discuss and even co-design our models and simulation with colleagues from various background, experts or stakeholders. During the training, you will have to do most of the practical work in collaboration with other participants and you will learn tools and techniques to design and communicate your models. However it is still a training on ABM implementation, so if you are interested mostly by the process of collaborative modelling, you may be more interested in attending a Companion Modelling training. Group work : a large part of the training (16 to 20 hours) is dedicated to the practical design and implementation of a model. Participants will be invited to form groups of 2 to 4 people according to the type of problems they are interested in. A set of typical situations and problems that can be studied with agent based models will be proposed by the trainers. Choosing one of them, each group will design, implement and explore a model inspired from this situation. We encourage that in each group, framing and conceptual modeling is done collectively but that each participant implements the model on the platform s.he has chosen. It means that ideally there will be in each group only 1 conceptual model, but as many implementations (possibly on different platforms) as participants. 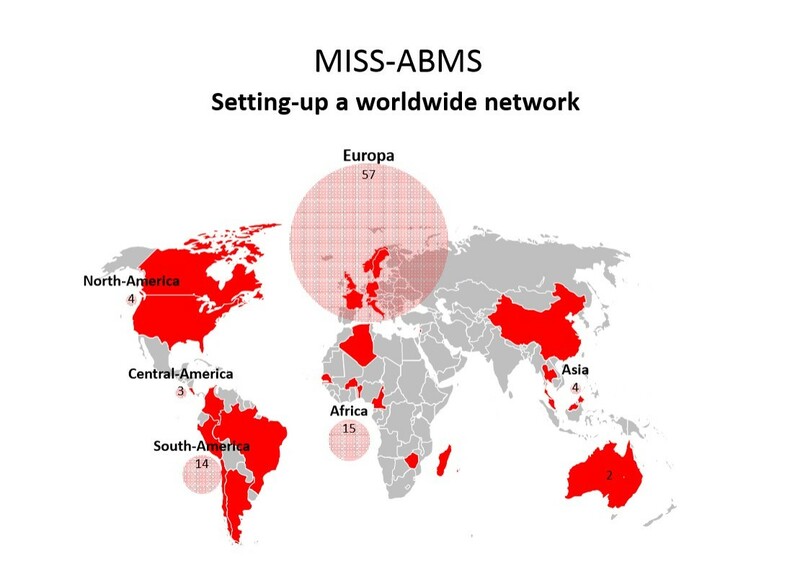 Watch the video presentation of the MISS-ABMS training session presented at the CoMSES Net (Network for Computational Modeling in Social and Ecological Sciences) virtual conference. On Friday morning of week 2 there is a plenary restitution of the different groups models and a debriefing and the school ends at 1pm. 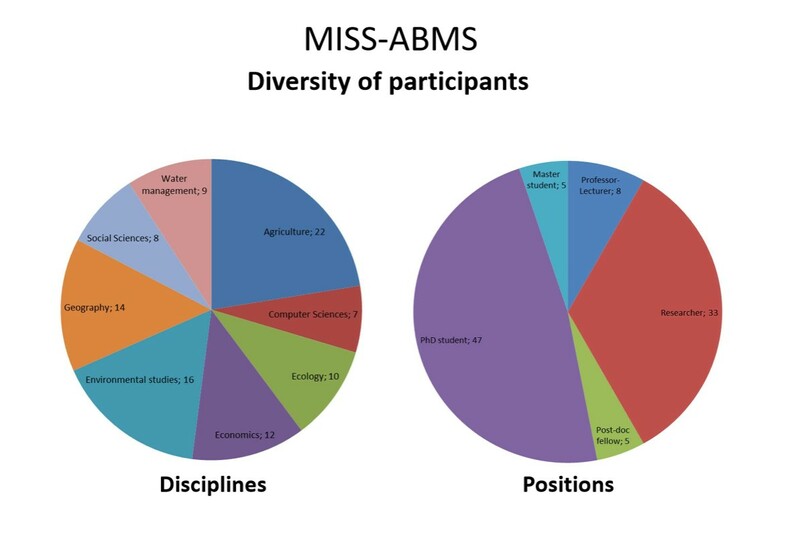 We enjoy having each year participants with very heterogeneous profiles in terms of age, nationality, scientific background and experience in modelling or coding. Candidates should have an interest in applying modeling and simulation to renewable resource management issues and sharing some or all part of the modeling and simulation process with people who are not experts of the model. No previous knowledge on ABM is required. However as a large part of the practice will consist in programming a model on one of the platform, some previous experience in computer coding is strongly recommended. For those with not any consistent experience in computer coding, please contact us specifically. The summer school lasts over two weeks and represents a total of 70 hours of training. Specific time slots will be allocated to teach the graphical language UML as well as to introduce the generic platforms Cormas, Gama and NetLogo by demonstrating the same benchmark model. Participants will get a chance to get a hand on each platform and then they will have to choose one to develop their model. Géraldine Abrami, Bruno Bonté (Irstea), Pierre Bommel, François Bousquet, Jean-Pierre Müller, Christophe Le Page (CIRAD), Patrick Taillandier (INRA), Benoît Gaudou (Univ. Toulouse), Nicolas Bécu (CNRS). I am a research engineer in a research unit about water management. In a team where we study and support the implementation of public policies on water management at various scales, I develop and support the development of models to foster communication and viewpoint exchanges among scientists and stakeholders. My background is in physics and engineering and I have been developing agent-based models with Cormas and then with Netlogo for more than 10 years. These last years I have been focusing on developing tools and methodologies to bring stakeholders into modeling and exploring their issues with haptic role-playing games. With my colleague Nils Ferrand, we have issued a kit called Wat-A-Game for making role-playing games about water management using mainly paper and pebbles. My research interest lies essentially on formalisms and tools to develop and explore models with stakeholders. I am also a member of the Companion Modeling network. Nicolas Becu is a modeling scientist from CNRS. He is a member of LIENSs research unit, an interdisciplinary team on coastal & environmental research based at La Rochelle (France). He develops and uses multi-agent simulations to investigate the links between social interactions and environmental management in various case studies and is carrying companion modeling approaches to bring together scientists, civil society and decision-makers. I am a modeller scientist at CIRAD. I contribute to promote the Companion Modelling approach. 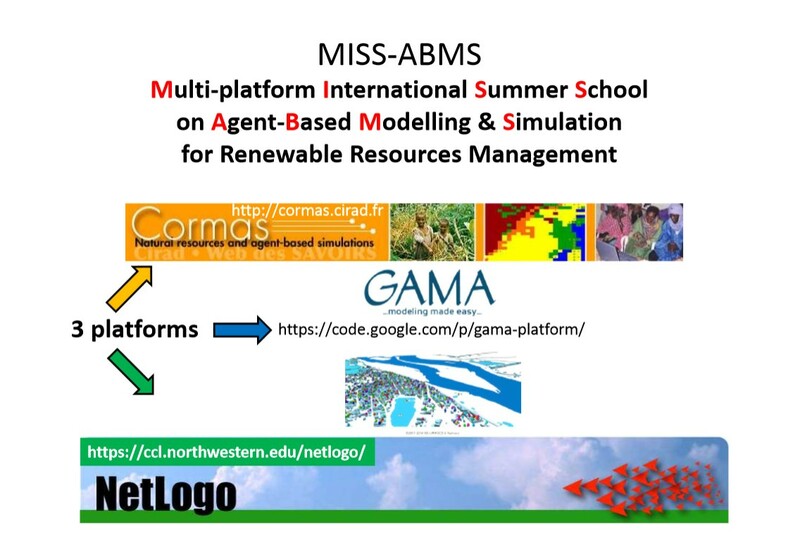 Through the development of CORMAS, I have been focusing on the development and the use of Multi-Agent Systems for the simulation of renewable resource management issues. I have been working in Brazil for 10 years, at the University of Brasilia until 2011 then at the PUC-Rio University. Now I am based at the UCR since 2015. I develop models related to environmental management, such as breeding adaptation to drought in the Uruguay or as breeding and deforestation in the Amazon. Nowadays, I am especially interested on collective design of ABM and interactive simulation for assisting role-playing games. I'm a researcher in Modeling and Simulation applied to Social and ecological systems. Since 2013 I am working especially on hydrological and social systems. My research project is to use simulation models as a media between actors and disciplines. Therefore my research topics are about model specification (Using Discrete Event System Specification), modeling paradigm (using ABM and CORMAS), and formalization of controlled systems properties (in the framework of viability theory), and model use (interacting with the Companion Modeling network). Dr François Bousquet is at the origin of the companion modelling approach. For more than 30 years he has been focusing on the development and the use of Multi-Agent Systems for the simulation of renewable resource management issues. Through the development of CORMAS, he has taken part in many experiments dealing with simulation and environmental management, mainly in developing countries. He is also member of the resilience alliance research organization that explores key concepts of resilience, adaptability and transformability and provides a foundation for sustainable development policy and practice. I'm researcher in social geography and spatial modelling . To tackle the scientific challenges proposed by landscape dynamics and cooperation processes, I have developed a research methodology based on field work and companion modelling combined with the formalisation of the observed processes and agents based models. This approach offers the possibility to understand : spatial, social, cultural and / or economic conditions that take place on territories, and to provide prospective scenarios. and sensibility analysis of spatial patterns behaviours, and more generally in Free Software communities. Active member of the companion modelling network. With a background in fish population dynamics, I have progressively specialized in building agent-based models to simulate the interplay between ecological and social dynamics in ecosystems holding renewable resources used or managed by different categories of stakeholders. I am participating in the development of the CORMAS platform, with a special interest on spatial aspects and computer-assisted role-playing games. I am Associate Professor in Computer Science. After a PhD in Artificial Intelligence (in particular in modeling in logic of group attitudes), I specialized in agent-based modeling and simulation. I am particularly interested in the modeling and integration of complex agents in simulation and in particular of agents taken into account trust or emotions in their decision making process and behavior. In addition, I work on models integrating mathematical and agent-based models. I am taking part to the development and documentation of the GAMA platform, in particular to tools allowing to link mathematical and agent-based models. I am a computer scientist. Since more than 30 years, I am interested in understanding the functioning of complex systems, and in particular human and social systems. With a large background in Artificial Intelligence, I am one of the promoter of the multi-agent systems (MAS) in Europe. I am now focusing on knowledge representation and using MAS for socio-ecosystem modeling and simulation. I designed and maintain a general-purpose modeling and simulation platform, called MIMOSA, based on DEVS for multi-paradigm integration (equations, automata, MAS, etc.). I use MIMOSA to design a modeling language, called EZAKA, to describe the structure and dynamics of multi-institutional socio-ecosystems for complex simulation. Additionally, I am promoting modeling as a form of multi-disciplinary/multi-stakeholder knowledge engineering. Dr. Cyril Piou is an ecologist who started working with agent-based models in 2003. He applied the approach to many different ecological systems (forests, crabs, fishes, insects…). Within the realm of ecological modelling, he participated in the promotion of pattern-oriented modelling and the use of standard protocols to describe agent-based models. Since 2010, he applies different modelling approaches to locust ecology and management among which agent-based models help to analyse the emergent group behaviours of locusts and to represent the anti-locust management systems.